(as of 04/24/2016 22:18 UTC)Product prices and availability are accurate as of the date/time indicated and are subject to change. 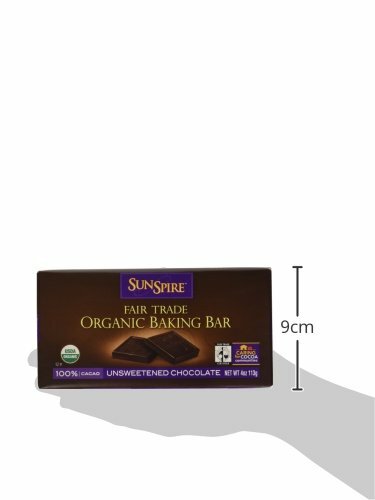 Any price and availability information displayed on Amazon at the time of purchase will apply to the purchase of this product..
Sunspire's Organic Fair Trade Baking bar delicately balances high cocoa content with cocoa butter for an intensely rich chocolate flavor and silky smooth melted texture, the ideal baking bar for indulgent desserts. 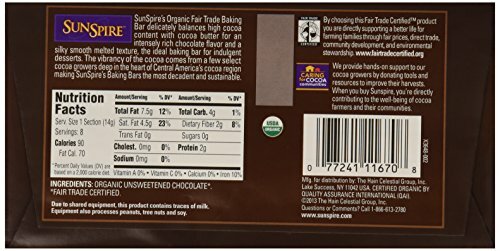 The vibrancy of the cocoa comes from a few select cocoa growers deep in the heart of Central America's cocoa region making SunSpire's Baking Bars the most decadent and sustainable.